Errol Spence Jr. retained his IBF Welterweight World Championship in his hometown in front of 47,525 fans with a unanimous decision over four-division world champion Mikey Garcia in the main event of the first Premier Boxing Champions, Saturday night, at the AT&T Stadium in Arlington, Texas. “I really appreciate the love and support of the fans tonight,” said Garcia. The bout started technical, with Spence pumping a consistent jab and attempting to cut the ring off while Garcia was patiently looking for a chance to counter. Garcia had some success early throwing counter left hooks over Spence’s jab, but was never able to get in a rhythm against the busier champion. “He came out here with a good game plan and kept the distance at his favour,” said Garcia. Spence increased his body-punching as the fight went on and looked to wear down the fighter who was moving up in weight. Garcia began bleeding from his nose in round eight, at which point Spence increased his output and landed 35, 29, 34 and 25 punches in rounds nine through 12 respectively, according to CompuBox. 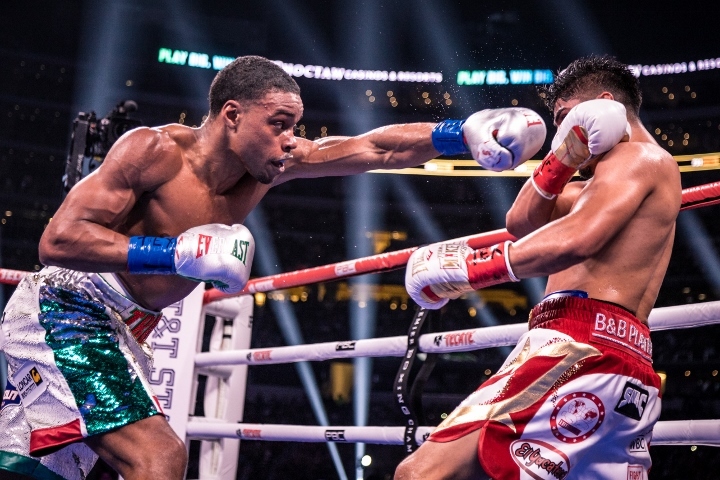 While Garcia was turned from man to boy taking the beatdown, Spence was simply too effective, with one judge even scoring round 11 10-8 for Spence. Spence threw a career-high 1082 punches and out landed Garcia by a staggering 345 to 75 margin.